Figure 7-54. - Resistance reduced-voltage starter. 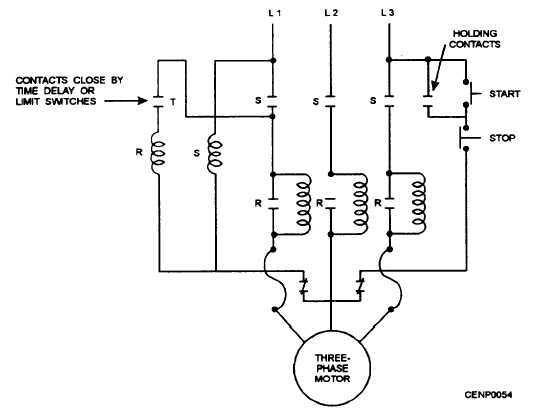 Part-winding starters use two magnetic starters and operate like a resistance start controller. 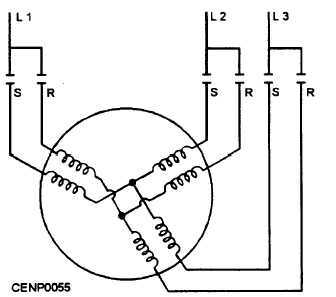 Figure 7-55 is a schematic drawing of a wye-connected, three-phase motor. The control circuits for the S and R relays are the same as for a resistance reduced-voltage starter, and so they are not shown. The S relay is energized first, connecting voltage to only part of the winding. The motor starts to run but develops little torque. At a predetermined time, the R relay closes. This action parallels the windings in the motor, reducing their resistance and causing increased current flow and more torque. An electric motor must be checked, maintained, and repaired just like any other piece of mechanical equipment. With proper servicing, a motor will last longer and give more efficient service. Included in maintenance services are cleaning, lubrication, ventilation, and testing. Inspect motors internally and externally for foreign materials, such as dust, dirt, corrosion, and paint. Open- frame motors may be blown out with compressed air. You should not apply too many coats of paint to motors. A thick coat of paint will interfere with heat dissipation. Figure 7-55. - Part-winding starter.